These days, taking a shower apparently can improve your athletic performance. Or not. Here is the freshest from the world of marketing, soon coming to a bathroom near you. If you ever wondered where I come up with the ideas for my articles, well, this one was conceived under the shower. Which sounds strange, but happened for good reason: while I was under there singing (no, not really), I for once happened to look more closely at the shower gel I was using. 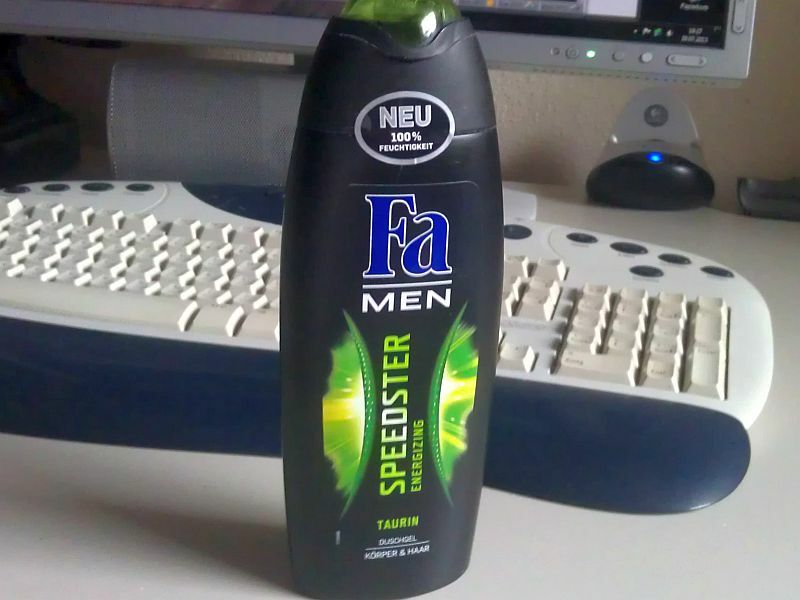 Yes, this really is a shower gel as sold in Germany, despite the predominant language on the bottle being English. My fellow Germans firmly believe that anything is way cooler, more sophisticated and urbane if it’s in English. We even go as far as inventing new English words to indulge this: in Germany, the English adjective “handy” is the word for cell phone and one German backpack manufacturer called his new product line “body bags”. He was a bit embarrassed when he learned that this particular Anglophile word combination already existed in entirely different circumstances. But I’m digressing, because what I wanted you to notice is the mention of taurine toward the bottom of the bottle. Taurine, the amino acid often found in energy drinks and having some limited evidence about improving athletic performance. When used as a supplement, it is usually ingested, so what does it do in a shower gel? It seems the company didn’t trust its costumers’ English skills that much – the waxing is in German. The second bullet point from the top mentions a “strengthening and invigorating freshness with taurine”. 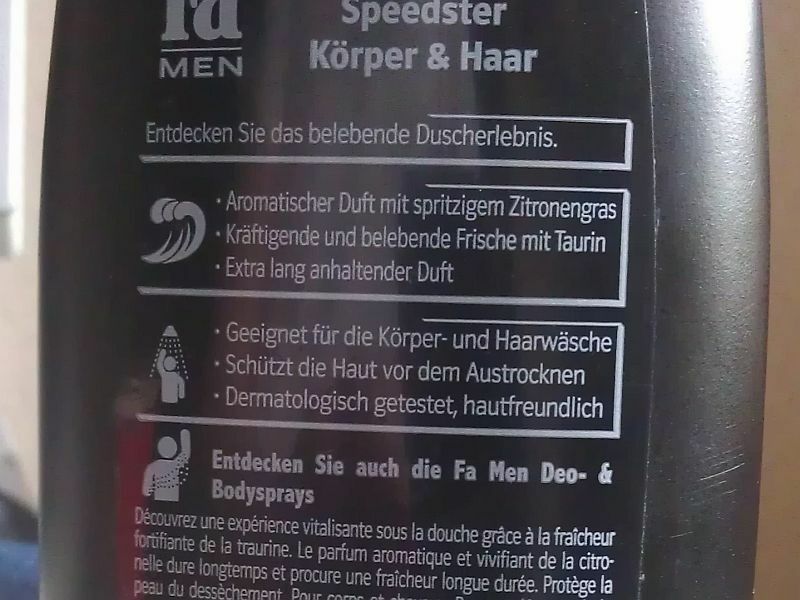 I don’t know about you, but to me this seems as if the men at whom this product is aimed are invited to transfer the effects of taurine when used as a supplement to this shower gel. Could that work? Could you shower with this gel and then do better at your fitness? Does that mean we then have to shower before we work out and get all sweaty? Questions over questions. The answer to these seems to be “no”. I searched up and down for evidence of taurine reaching the muscles and blood stream via the skin – which would be needed to let it work in the same way as when taken as a supplement – but to no avail. The dermis is as far as taurine seems to go through the skin, making an “energizing” effect unlikely. Apparently, when applied to the skin, taurine will only penetrate as far as the dermis, the middle layer coming before the subcutaneous tissue. One study found that the presence of taurine there can preserve skin moisture, which would give putting taurine in a shower gel some sense, but that is all. It’s Coming To Get You! When I wrote this article, I wasn’t sure where it should be classified, but taking into account that taurine is normally sold as a supplement and that we apparently are invited to make the connection, I finally figured that category would be appropriate. Given that many supplements promise much and hold little, it also seems right at home there. You in North America brace yourself for touchdown of this stuff on your shores: the company behind it is apparently in the middle of the product launch. Funnily enough, in the US Fa is distributed by exclusive Abercrombie & Fitch – quite an improvement for products that around here sell at €2. 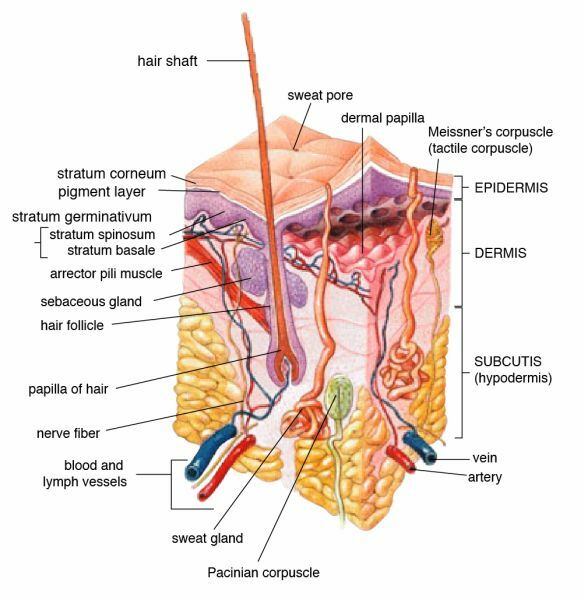 Bull picture courtesy of Emmet Tullos, skin cross-section diagram courtesy of the National Cancer Institute. I wonder if they’ll find another use for this? Bahahha Body bags! That is hilarious! A lot of products are sold to be used topically with the promise that they will reach you internally… I’m not convinced at all. The best way to energize yourself (or become tighter, firmer, you name the product promise) is to EXERCISE, SLEEP AND EAT WELL. If only there was a way to extract the taurine from the bottle and lather it on all over. I need to come up with a plan. I’ll be a millionaire.